Steve Jobs stunned the world today by announcing the release of the largest 'portable' media player ever. It is the newest in his ever popular iPod series, and it is currently being called the iPod Crush. The new iPod supports a whopping 6ft x 4ft screen that rivals any big screen living room TV. Jobs is reporting that the unit uses the same touch screen technology as the iPhone. It comes complete with wifi, bluetouth, the entire Swiss Army (all troops come with knives), snacks for the trip, and a roll of duct tape. There are rumors that the new iPod Crush will even reduce your carbon footprint. Taking things in good jest and confident in his new product, when Jobs was asked by reporters who were concerned about the size of the new iPod Jobs said, "Hey, if it doesn't crush the competition it will at least crush you." 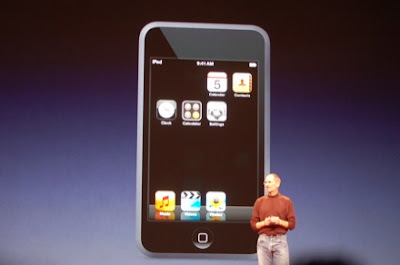 I know this new iPod Touch from Apple is supposed to be cool, but Steve, I just don't think an iPod of that size will fit in my pocket.